In May of 2010 we entered into an agreement with Calhoun Super Structures of Tara, Ontario to become a dealer. After 10 years with Cover-All Building Systems we were excited about a fresh start. We looked for a company that could service any new customers as well as look after all our existing clientele. 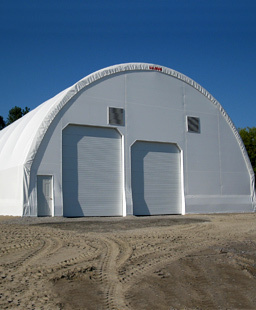 Calhoun is a forward thinking company leading the way in fabric building design, manufacturing and construction. We have direct access to all departments at Calhoun which allows us to provide answers quickly to all your questions. Browse through some of our projects and check back regularly, as this section will grow rapidly. For more information regarding Calhoun Superstructures click here to view their website.